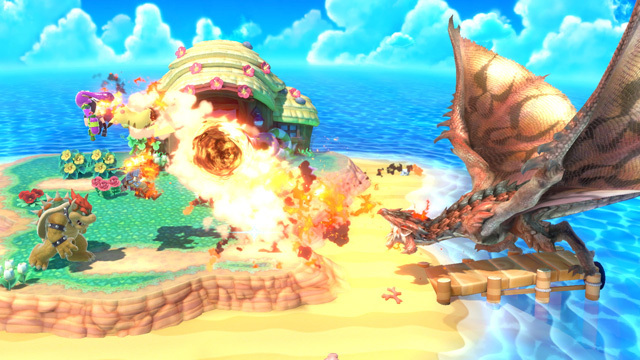 The latest Nintendo Direct unloaded a bevy of new details about December’s Super Smash Bros. Ultimate. Besides the announcement of five new playable characters, much unforetold was given about the old and new stages, new items, and now ways to play Super Smash Bros. In addition to a greater look at the new New Donk City level and Dracula’s Castle, multiple retro stages were confirmed to return, including Fountain of Dreams, Pokémon Stadium, Garden of Hope, Brinstar Depths, Summit, Unova Pokémon League, Magicant, Gamer, and Final Destination. Every stage now has a Final Destination and Battlefield form along with a hazard toggle (as with turning off the Yellow Devil on Dr. Wiley’s Castle). 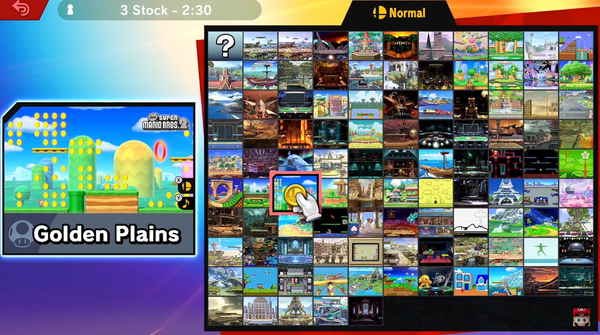 There are now 103 stages confirmed for Smash Bros. Ultimate, a series record to date. A number of new Assist Trophies were showcased, including several third party character surprises. Capcom’s Monster Hunter represents with the mighty Rathalos, who is both an Assist Trophy and a stage hazard (on a Ancestral Step Monster Hunter level). 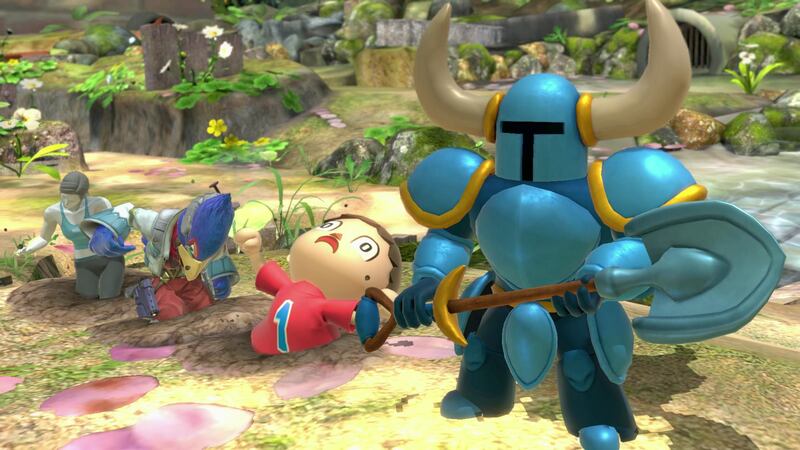 Zero appears from Mega Man X, while Shovel Knight cameos as an Assist Trophy who digs up the stage for items as well as attacks. The moon from The Legend of Zelda: Majora’s Mask was also present and accounted for. 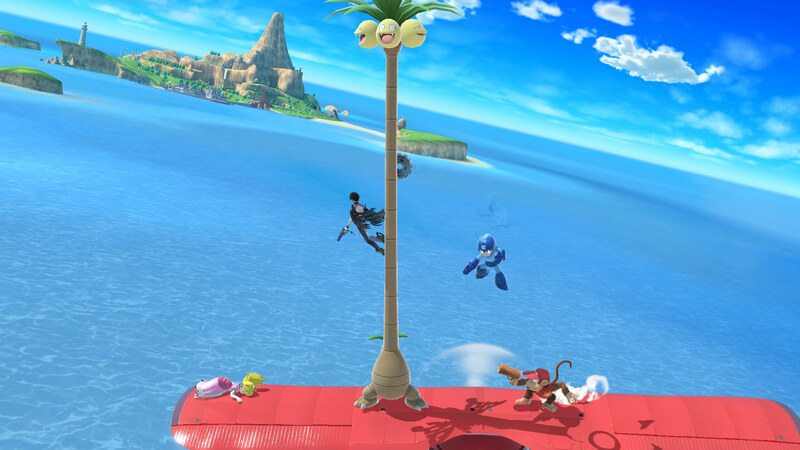 Several new Pokemon were shown in action for the Direct, including Abra, Solgaleo, Lunala, Mimikyu and the enormous Alolan Exeggutor. And after being pulled from Super Smash Bros. Melee, Ditto finally makes its Smash Bros. debut as a double of the fighter who triggered its appearance. A new way to experience the hoards of stages is a match mode where you select two stages that morph from one to the other mid-match. All the 103 levels are unlocked from the start, and are arranged by the order of their appearance. Besides character-driven items, regular items were also revealed en mass. Introduced were the Killing Edge, Bomber, Death’s Scythe, Staff, Ramblin’ Evil Mushroom, Rage Blaster, and a Banana Gun that fires in one spur. If it shoots you, it’s gonna hurt, and the remains can tossed to create a slippery peel for opponents to step on. Super Smash Bros. Ultimate has a grand total of 800+ musical tracks and 900 hours worth of music. Music shared by the same series can now be selected across all stages from that franchise via My Music, a stark contrast to past games that had their own set of tunes. The Sound Test menu now lets you form your own playlists to prioritize your favorite tunes. 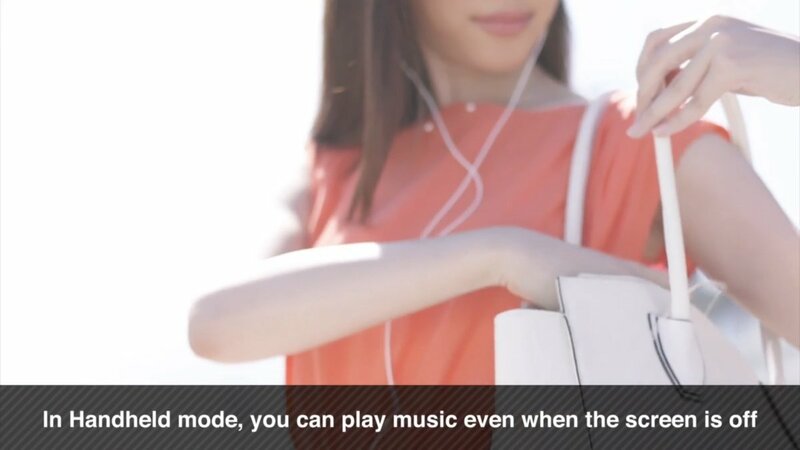 And as with Super Smash Bros. for Nintendo 3DS, you can leave your Switch in sleep mode while on the go and listen to the music with headphones on. In multiplayer (Smash) mode, matches start with a rule set (which you can save for later) and the stage selection before even selecting a fighter. The rules themselves default at stock matches rather than the usual timed matches. However, Stamina mode now joins those rule sets as one of the standards, coming in both stock and time variants. 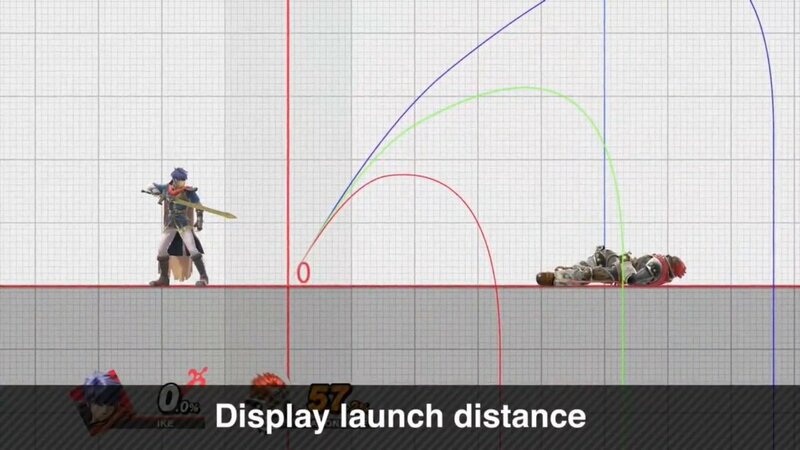 You also have the option to unleash Final Smash attacks via a meter rather than the Smash Ball. Two Final Smashes cannot occur at once. Multiple new multiplayer modes have been added for Ultimate that create new ways to brawl. Smashout Mode is an elimination match that removes characters from further games once they lose. 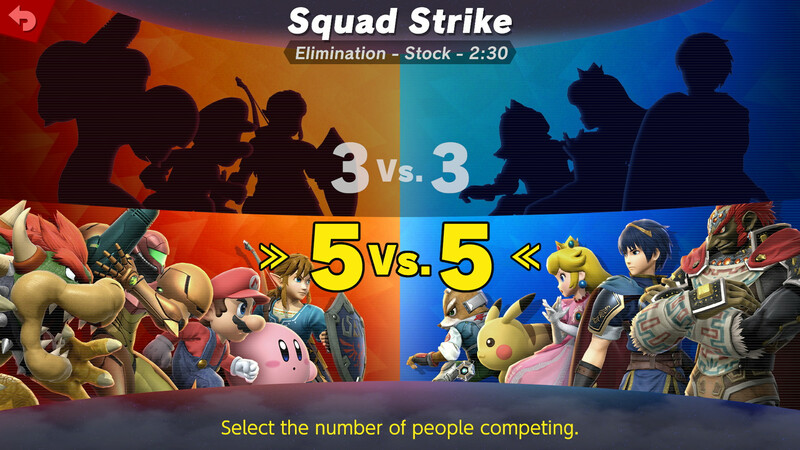 Squad Strike utilizes 3-3 or 5-5 team-ups to eliminate a series of consecutive fighters in battle. It’s similar in concept to the Marvel Vs Capcom series, without the tag team element. A local Tournament Mode for up to 32 players is also included out of the box, no patches required. For single players, Classic Mode makes its return. 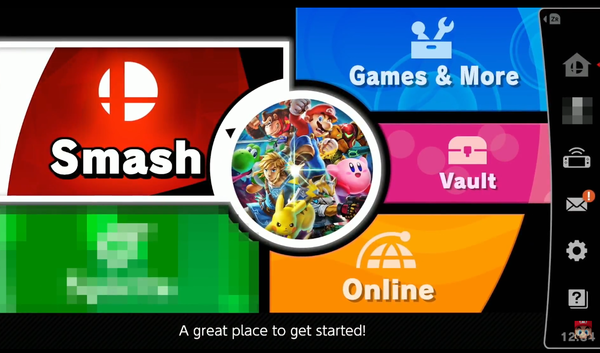 With the freshly revealed top menu, a mystery mode was blurred out. This mode will be revealed at a later time closer to launch. All the other expected modes such as the Vault and Games & Mode are present, as is a dashboard for quick options, accessed at any time via the ZR button. Training Mode now has its own exclusive stage with a grid background to show relative distances of attacks and how far your hits affect the opponent’s trajectory. For European Smashers, a Limited Edition of Super Smash Bros. Ultimate will be released at launch that includes the game, a GameCube controller and its USB adapter. No word on a North American launch was given. The limited and regular editions launch worldwide December 7th, as will a selection of new Smash Bros. amiibo such as Inkling Girl and Ridley..